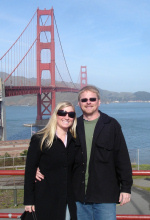 Jason and I currently live in a brand new home we bought in May of 2006 in Manhattan Beach. We love everything about home ownership, and after living near the beach, truly believe the saying "location, location, location." We both work at home... so enjoying where we live is a necessity. Located just three short blocks from the beach, we get to hear the Pacific Ocean and see immaculate sunsets almost every evening from our third floor deck. That sunset photo was taken from our balcony! Jason started CouponShare.com in the Fall of 2003 and couponSeven.com in the Summer of 2006 and their success has brought our dreams to reality. Both websites are premium sources for the best online store coupons on the Internet. In 2006 alone we traveled to Germany, France and Nederland during the World Cup soccer tournament, Jason purchased a dream car (an Aston Martin V8 Vantage), and of course we got engaged! We love to travel and explore. We're attempting to make a dent in 10,000 places you should see before you die! This year we took a trip up Highway 1 from Los Angeles to San Francisco and Napa Valley in the baby Aston so Jason could test its performance; no worries it passed! At the end of March we went south of the border and soaked in Cabo San Lucas. In May we went saw the entire big island of Hawaii. For most of the month of June we went to Europe and saw London, Dublin, Monaco, Nice, Cannes and St. Tropez. We didn't take an official honeymoon as we have already taken multiple trips prior to the wedding and booked many after. In August, 2007 we went to Chicago and Las Vegas for two quick trips. We like the food, entertainment and especially Cirque Du Soleil shows in Las Vegas! We stayed at the Ritz, walked Navy Pier, ate at the Melting Pot (and other great restaurants) and enjoyed a relaxing river boat trip among other things in Chicago! In September we spent a long weekend in Santa Barbara going on wine tours and shopping. We also went on a two-week vacation to the original Oktoberfest in Munich, Germany and Italy at the end of September and beginning of October. And to top off 2007 we spent a week in Colorado during Thanksgiving to visit with Rod & Tina's new baby boy Talon! With our virtual Internet businesses, as long as we have a computer and an Internet connection we can travel anywhere! Typically we bring two laptops on our trips so that we don't have to worry about the computer! Some facts and our favorite things… Jason loves dark chocolate – the darker the better! JoAnn enjoys a great cup of java, with a hint of hazelnut. Jason digs exotic cars – see his website dedicated to them HighRPMs.com. JoAnn is a runner and in 2006 she completed the Los Angeles Marathon in 4:55:37. Jason has a collection of over 1,000 DVDs and counting... We are practically a Netflix! JoAnn has always loved to cook and has a kitchen full of gadgets. JoAnn and Jason are in love and are so excited to have shared this moment with all of you!